Dolly Stolze introduces Frances Glessner Lee, a pop culture inspiration who many believe was the inspiration for Jessica Fletcher, the crime-solving mystery novel author in Murder She Wrote. Lee’s Nutshell Studies also inspired an episode of CSI where miniature crime scenes were left behind by a serial killer as clues. 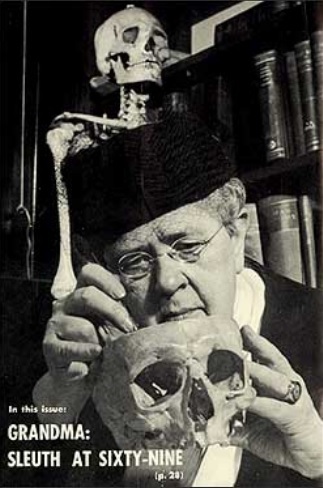 Lee is known as the “Patron Saint of Forensic Science” because her work helped to advance forensic science as a field and the way deaths are investigated in the United States. Dolly is a writer and researcher with a Masters in Forensic Anthropology from California State University, Los Angeles. Though her first love is Forensic Anthropology, she also enjoys writing about macabre history and the bizarre things that happen to human remains. Dolly runs Strange Remains, a blog site about human remains in the news and the strange history of corpses. She also guest blogs for Atlas Obscura and Defrosting Cold Cases. 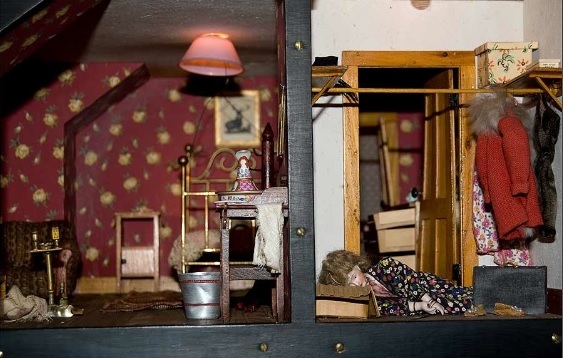 Frances Glessner Lee (1878-1962) was an early advocate of legal medicine and an expert in death investigation, but she is best known for her miniature murder dioramas, known as the Nutshell Studies of Unexplained Death. The Nutshell Studies are scenes of violent death that helped to teach investigative techniques and elevated crime scene reconstruction to an art form. Lee also helped to establish the Department of Legal Medicine at Harvard that had a cutting edge crime lab, trained medical examiners, and arranged seminars for police officers. On March 25, 1878, Frances Glessner Lee was born to Frances Macbeth Glessner and John Jacob Glessner, who were wealthy Chicago cultural elite. According to Corrine May Botz, in her book The Nutshell Studies of Unexplained Death, Frances Glessner, a wife beloved for her home-making skills, and John Glessner, the co-founder of International Harvester, believed in rigid gender roles and forced those ideas onto their children. Frances was home-schooled and taught knitting, painting, and embroidery. When Lee expressed her desire to go to college her parents forbade it, something Frances always resented. In 1898, Frances married Blewett Lee, a young law professor, and had three children. Although Frances realized that she and Blewett were not compatible a few years into their marriage, they did not formally divorce until 1914. Her brother, George Glessner, was allowed to continue his education and attended Harvard Medical School. In fact, it was one of her brother’s med school buddies, George Burgess Magrath, who inspired Lee’s pursuit of a career in forensic science. They discussed cases of unexplained death and the challenges of death investigation. Magrath would become the medical examiner of Suffolk County in Boston and worked on some of the most gruesome murder cases in New England. Lee and Magrath would eventually work together at Harvard’s Department of Legal Medicine. After Frances Glessner Lee’s parents died (her mother in 1932 and her father in 1936), she came into her inheritance and was able to chase her dream of a career in death investigation. She started by underwriting a professorship of legal medicine, financing the George Burgess Magrath Library of Legal Medicine, and helping to endow a Department of Legal Medicine-all of which were at Harvard. Lee became a consultant to the Department of Legal Medicine and was very hands-on: she constructed teaching tools, like the Nutshell Studies; planned the Seminars in Homicide Investigation and the Harvard Associates in Police Science (HAPS); she was consulted during investigations and was present at autopsies. In 1943, the New Hampshire Police acknowledged the progress that she had helped to make in forensic science by making her an honorary captain. Also in 1943 Frances Glessner Lee started constructing the famous “Nutshell Studies of Unexplained Death.” They got their name from a police saying, “Convict the guilty, clear the innocent, and find the truth in a nutshell.” Although the Nutshell studies were crime scene reconstructions, they were not representations of one actual case but composites of several cases that she and her colleagues had investigated. The Nutshell Studies were built at Lee’s New Hampshire home in a workshop filled with dismembered doll parts and tiny furniture. Her carpenter helped her make the miniature homes, shacks, and cabins that varied “in size from an 8”x14” shack to a 30” square three-room dwelling.” According to Botz, Lee and her carpenter referenced police reports and court records to reconstruct the scenes on a one-inch to one-foot scale. Many of the features of the dioramas, like lights, window shades, and mousetraps, actually worked. To assemble her corpses, Lee used heads from antique German bisque dolls, limbs made of painted wood, and torsos stuffed with BB shot. She also sewed all of the clothing and knitted the stockings. Lee also carefully painted each body so that it matched the cause of death and stage of decomposition. For example, Lee painted strangulation marks around the neck of one doll, she painted another a rosy hue to indicate a death from carbon monoxide poisoning, and another was painted purple to suggest an advanced state of decomposition. Then Lee carefully hung, shot, or stabbed each doll as the case required. 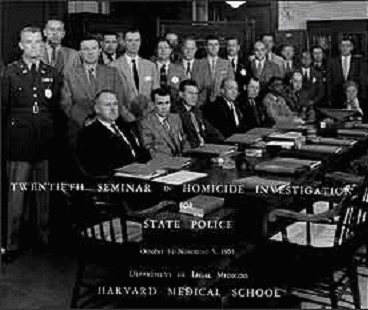 The Nutshell Studies were used as teaching tools during Harvard’s Seminars of Homicide Investigation and the Harvard Associated in Police Science. Attendees were separated into groups and assigned two Nutshells to study. The goal was not to solve a mystery but designed as an exercise in identifying and evaluating vital evidence in a violent death scene. When the Nutshell Studies were not being used in a seminar they were displayed in a specially built room at the Department of Legal Medicine at Harvard. Frances Glessner Lee helped to fund the Department of Legal Medicine and also worked there as a consultant. It became operational in 1938 and was first headed by Lee’s friend, Dr. George Magrath. According to Lee it had two purposes, “Research into the causes of unexplained death, and the practical application and teaching of the results of that research to those who will use it…in the interests of science and justice. “This department trained medical examiners, had a forensics lab, and held seminars that taught death investigation techniques to police. I was curious about the forensics lab established by Frances Glessner Lee and how it functioned. 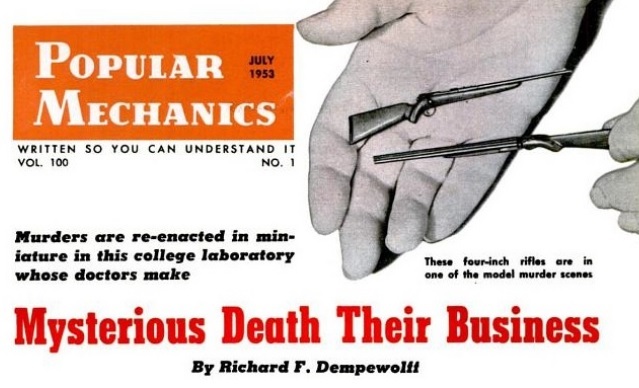 I found an article written by Richard F. Dempewolff, who visited the Department of Legal Medicine at Harvard and wrote about it in a 1953 issue of Popular Mechanics. In 1953, the Department of Legal Medicine was on the upper floor of the Harvard Medical School building and was chaired by pathologist Dr. Richard Ford, who was also the chief medical examiner of Suffolk County. In the 1950’s there were an estimated 2500 violent deaths in Massachusetts each year, and the Department of Legal Medicine investigated and performed autopsies on more than 500 of those bodies. 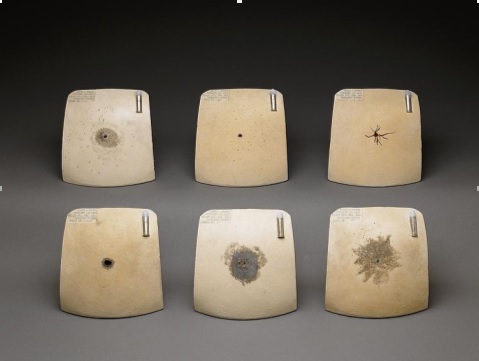 Under the heads were rows of flesh-colored plaster casts of gunshot wounds and powder burns made by different types of bullets shot from varying distances. Investigators at the department used these plates to help estimate the distance a bullet was shot. In the “legal medicine lab,” technicians preserved human tissue to mount on microscope slides, test blood samples, and examine trace evidence. I don’t know why, but I was really surprised by how thorough this lab was. “To the quiet whir of motors in another room, little cubes of tissue are being coated with paraffin in a complicated apparatus resembling a miniature merry-go-round. A precision knife cuts slices 1/10,000 inch thick from these wax-embedded bits, so they can be stained and viewed under a microscope. This seems pretty routine until Mr. Glass, the white-coated assistant to Doctor Ford, tells you the cubes of tissue are part of a man who was killed yesterday under suspicious circumstances. When the department closed, Russell Fisher, who was a professor of legal medicine at Harvard and the chief medical examiner of Maryland at the time, arranged to have the Nutshell Studies, the plaster heads, the gun shot wound casts, and other department resources moved to the Chief Medical Examiner’s Office in Baltimore on permanent loan. Frances Glessner Lee was a pop culture inspiration who many believe was the inspiration for Jessica Fletcher, the crime-solving mystery novel author in Murder She Wrote. Lee’s Nutshell Studies also inspired an episode of CSI: Crime Scene Investigation where miniature crime scenes were left behind by a serial killer as clues. Lee is also known as the “Patron Saint of Forensic Science” because her work helped to advance forensic science as field and the way deaths are investigated in the United States. A special thanks to Bruce Goldfarb, spokesman for the Office of the Chief Medical Examiner in Baltimore. His insight and guidance were greatly appreciated while writing this article. Also a special thanks to Erin N. Bush of Death in Diorama for permission to use images from her website. Botz, C.M. (2004). The nutshell studies of unexplained death. New York, NY: The Monacelli Press. Lee, F.G. (1952). Legal Medicine at Harvard University. J. Crim. L. Criminology & Police Science. 674 (1951-1952).